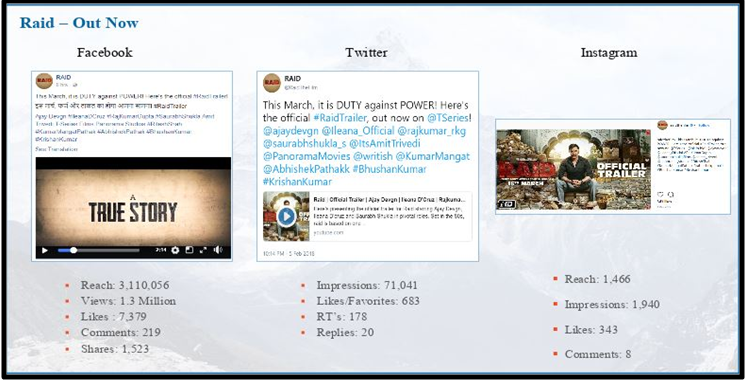 To create buzz around the movie Raid, campaigns that revolved around social media activities for their digital audience including on-ground event to remain relevant with the offline fans as well were created. 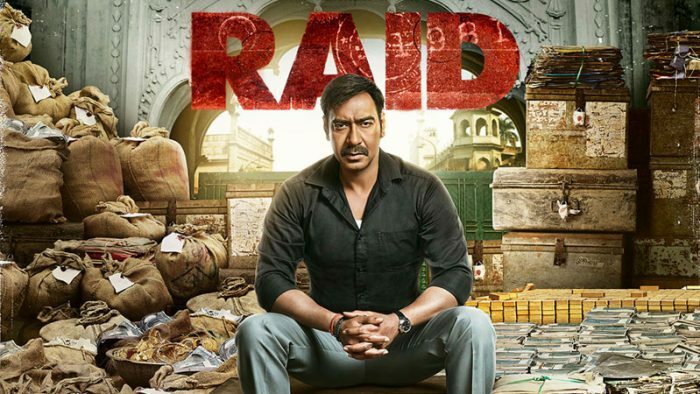 The objective of Raid’s digital marketing campaign was to create the perfect synergy between a story based on true events and a movie with powerful performances by the star cast backed by a chartbuster music album. • The campaign commenced with a hard hitting, theme based poster featuring Ajay Devgn with the trailer launch time and date announcement. • The on-ground event was done for the trailer launch that involved the entire starcast, director and writer of the film. Ajay Devgn and Ileana D’Cruz were a part of a personalized FB live (with the selfie camera) from the official social media page of Raid a few minutes before the trailer launch as a buildup. • Ajay Devgn’s fan clubs were activated for the trailer launch of Raid. • During the release weekend of the film, public reviews, media reviews and celebrity reviews were pushed aggressively across all platforms for good word of mouth toincrease ticket sales at the Box Office across the country. • With keeping first weekend in mind, rigorous digital and offline campaigns were done on Friday, Saturday and Sunday. • User generated activities including #RaidWithAjay, #BeAKhabri, and #SaluteEverydayHeroes were critical in keeping the fans engaged throughout the campaign. • #RaidWithAjay was an activity where in the trailer was supposed to be shared by the users across all platforms with an aim to ‘Raid’ their own profiles and other’s news feeds. • #BeAKhabri, was another such user generated activity where in the user had to guess the exact launch date of the songs ‘Raid Anthem’ or ‘Black Jama Hai’, keeping in mind the tonality of the movie, this activity gave the audience an opportunity to be an informer or a Khabri, in the ‘Raid’ digitally. • The trailer in turn got over 10 K shares online. Over 100 number of entries were recorded in our 2 day campaign across all social media platforms. • #BeAKhabri garnered over 135 entries across all platforms, it got fans excited for the song launch and resulted into a lot of conversations online before its launch. • WhatsApp marketing campaign with above 8 Million reach on Friday and Saturday including Twitter trending conversation campaign which garnered over 10 Million reach on Friday, Saturday, and Sunday. • On Facebook, the #RaidTrailer had reached a total of 1.1 Million people and has got over 7K likes, close to 1k shares and over 8.8K comments. • The official film handles crossed more than 8K likes on Facebook, 2.5K followers on Twitter, and 4K followers on Instagram within one month of its digital campaign respectively. • 10 Portals including Indian Express, Bollywood Hungama and Koimoi ran a contest to push ticket sales throughout the weekend. • The entire first week campaign plan in turn resulted into getting huge numbers at the box office with a growth of about 36.63% from Friday to Saturday and about 45.09% from Saturday to Sunday. • Twitter trend around the movie with a minimum of 2 different keywords happened from Thursday until Sunday. Swiggy celebrates 4th birthday with a tribute to its heroes – the delivery partners!